I've gotten a few blog awards over the last week or so and I thought it would be appropriate to post them today--Like gifts to myself. And since it's Christmas and we all know it's better to give than to receive I thought I would even spread the love and pass them on to others as well (which technically I would do even if it wasn't Christmas because those are kind of the rules of blog awards but we'll pretend that I'm making a special exception for today and that I'm giving and selfless and stuff). The first award I received was from the awesome Tamara Heiner. We met in the comments section of another blog (isn't it fun how that works) and she's great. This is the Honest Scrap Award which I'm supposed to pass to 10 people who I feel have honest blogs. Then I have to list 10 facts about myself. 1. Julie Nelson because she is always letting us delve into her daily life, and her writing life, with her in an honest, fun way that I love. 2. Renee Collins because she is fun and honest in her feelings and experiences. I enjoy her. 3. Corey Swartz makes me laugh and always shares her straightforward opinions. 4. Christine Bryant has let us experience her road to publication in an honest and helpful way. She's also very supportive of others. 5. Jenn Johansson is one of my most favorite people. Her blog is just as fun as she is. And I know it says 10 facts, but that's a lot, more than you'd ever want to know about me, so I'll share 5. 1. I love earrings. Big dangly ones. 3. And, relating to the confession above, I have the American Idol voting number memorized because unlike many people who say, "I'm a huge fan, but never vote." I admit that I vote.....at least ten times per episode. I know, it's sad. 5. When I was a kid I watched "The Sound of Music" everyday after school for a year. Every. Day. Yes, I still love it. And yes, I still know all the songs. I'm not quite so obsessed with it anymore, though. The second award I got is from Shannon O'Donnell who is so sweet. I think this award might have been made just for her. But she decided to give it to me anyway. 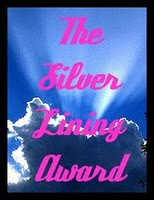 As part of this award I'm supposed to nominate 5 other blogs that find a silver lining even on those gray days. Again, because I have so many awards today, I'll pick 2. 1. Tamika is constantly finding the positive in things and I often feel uplifted after reading her blog. 2. Elizabeth also has inspiring posts and makes me smile. The third award I received is from Julie Nelson who makes me all kinds of happy. I know I mentioned her above, but I must say again, she's a fun read. If you haven't been to her blog yet, you should swing by. The rules with this award are that I'm supposed to share a childhood reading memory and then pass it along to 5 other bloggers. I feel very blessed because both my parents were avid readers. I would often go into their bedroom to find them both leaning against the headboard, side-by-side, reading lights on, quietly reading separate books. Most of my favorite reading memories from childhood include my father gathering all five of his children on his queen size bed while he read to us "The Hobbit" or "Lord of the Rings". I'm not sure how he got us all to sit still and listen, but I love him for it because he instilled in me a love of books as did my mother whom I rarely found without one. 1. Patti Nelson is one of my favs. She's lots of fun and always has insightful posts. Congrats on your three awards and to your recipients (all are great choices). Congrats to everyone! I'm not an American Idol watcher...I try to stay away from reality TV as much as I can! It's too addictive. I enjoyed your five facts too. *chants* Idol, Idol, Idol! Woo hoo! Brim over I assent to but I about the collection should secure more info then it has.